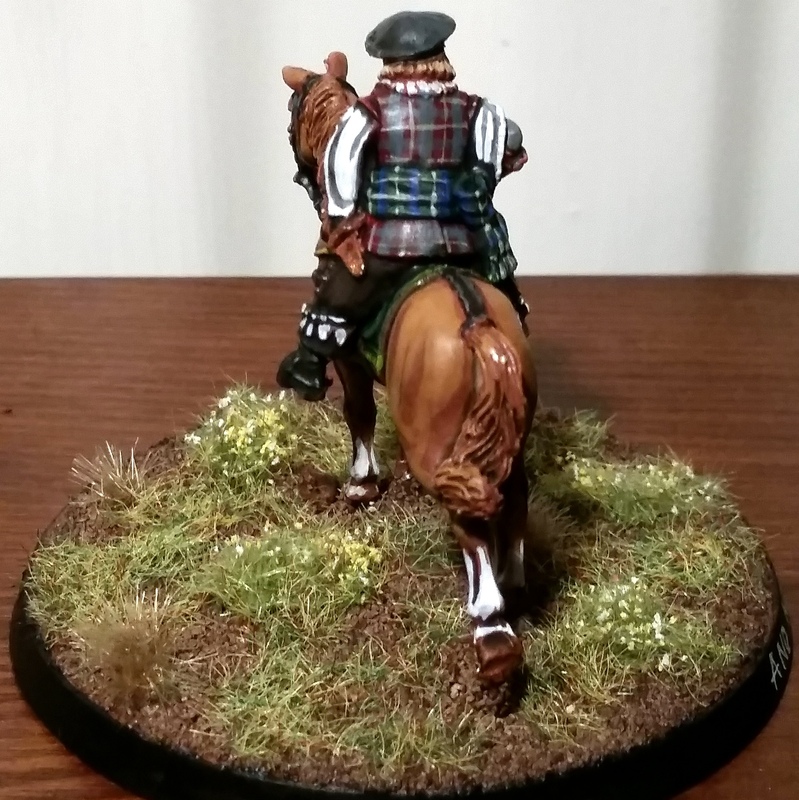 A Scotsman on a Horse! Originally Lord Leven, by Warlord Games. This is the first time I’ve had to paint tartans and I have had to experiment with them. I’ve mostly followed the clothing John Cleese wears in the sketch, although the actual outfit of the model is somewhat different. Another look at the two different tartans. In absence of decent natural lighting conditions I’ve had to take recourse to a few desk lamps set up in different angles. Not so very pretty, unfortunately. Up next: an official price list for my commission painting services for 2015. Spam! For the first time in years I got some models for Christmas from my parents – they rarely if ever buy me models because they believe I’m already well-supplied by now. I think not! Anyway, most of these new miniatures were Fallschirmjägers who have all been painted up by now, but the Firelock Storming Party box by Warlord Games was thrown onto the plastic pile. Until now! Plastic models with metal command sections by Warlord Games. These are really simple plastics – a tiny sprue with the body, two hats, and two types of arms holding a firelock. As you can see I added some different headwear from the other plastics plus a few metal Swedish morions. Other than that these guys are straight from the sprues. You can see the unipose models in all their monotonous glory in this picture. I opted to use another colour spray can, guilliman (or girly-man if you play Ultramarines) blue in this case. I then differentiated the models with various blue tones, by highlighting the blue with caledor sky, teclis blue, thunderhawk blue, celestra grey and white, before slapping on a drakenhof nightshade wash. Afterwards some more highlights and the usual leather , metallics and woodwork. Simple as that. Not the whole box was used to build this unit, as I still have six firelocks left. These will probably be mixed in with my musketeers when I continue work on them. Other than that, I’ll let the project go for a short bit as I have plenty of other projects to complete! Phew, these guys took me a long time to get started on. Way back last year I talked about feeling less inclined to paint a model when it consists of multiple separate parts that need gluing on later, and while the subject was entirely different this time (read: not an Ork trukk) I still felt the same ennui. That said, they’re finally done, well, apart from their bases. Let’s take a look. I put some more variety into this second batch with regards to the colours of their coats and such, but still adhered to the same palette so as not to estrange them from their fellows in the first rank of the unit. Other than that, painting them was identical to the first batch, apart from the fact that I was wise enough to glue their helms on after having painted their faces. And that’s where things went wrong: I really don’t like painting incomplete models. The bases obviously still need a lot of lovin’. Still, that’s them done. 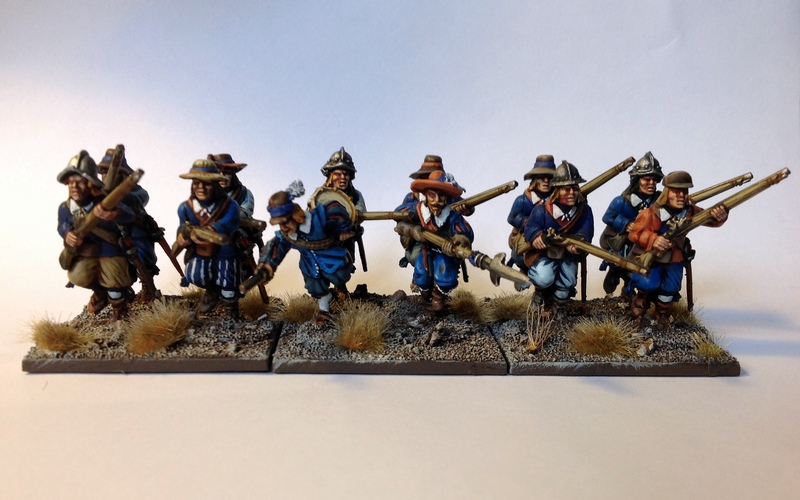 The rest of these Dutchmen are another project I’d like to hedge in this year; I’ve still two companies of shotte, a firelock unit and some casualty markers to do before putting this on hold, until the time arrives for me to take the plunge and buy the For King & Country starter set for Pike & Shotte. Maybe next year, who knows! Hello and welcome back to the blog for another update! I trust you’ve all recovered from the Monster Update feature. It was a huge success for the blog – I broke my views-per-day record with a mighty 154 views, which is really good for a non-advertised blog of this sort. I guess you have to be a young girl talking about fashion to get to the 5.000 view per day I hear people talk about from time to time. As my sole interest in fashion consists of the clothing and armour of my miniatures, such follies are beyond me! 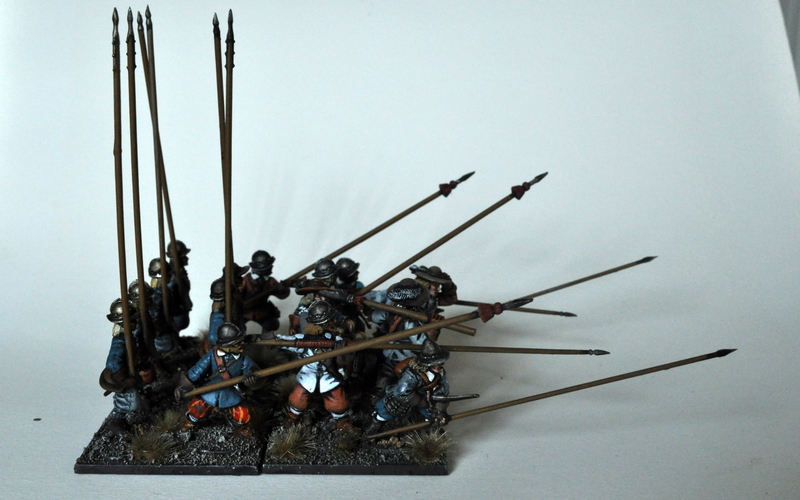 This rant aside: it’s time for another batch of models: the pikemen of my first (and currently only) Dutch battalion. These were actually completed a few weeks ago, but kind of fell off the grid for a while. But here they are. A mix of plastic and metal models by Warlord Games. These were actually assembled and undercoated quite a long time ago, but unfortunately I had a case of bad undercoat spray conditions. As a result, I had to strip the metal models in the command group, and some of the plastic ones were left with a bit of a gritty surface effect. The kit allows for some posability, but not as much as I would’ve liked. So I let these models lie around untouched for a while before I finally gathered my courage and put paint to them. I rushed some of the stages of the models as I found out I quickly tired of them; especially the lack of detail on the plastic parts affected by the undercoat spray were very difficult to get right. Still, I tried to incorporate some variety in the models which you can see in the second picture: those trousers! I’m really glad to be done with this pike block, and the second shooting company might rear their (painted) heads before the year is out. 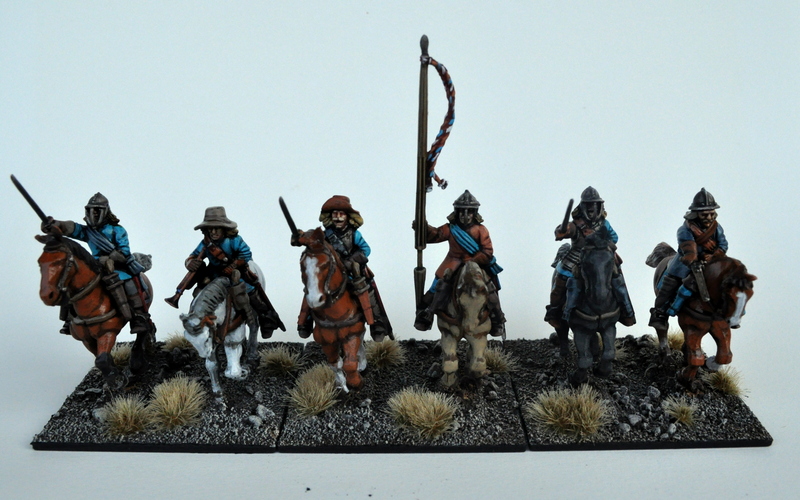 Of course, there’s also the second batch of cavalry that needs to be done for this army. When these are done I’ll probably put the project on hold; depending on commission work I might be acquiring a further box or two of plastics, but I’d rather focus on my bigger projects in 2014. 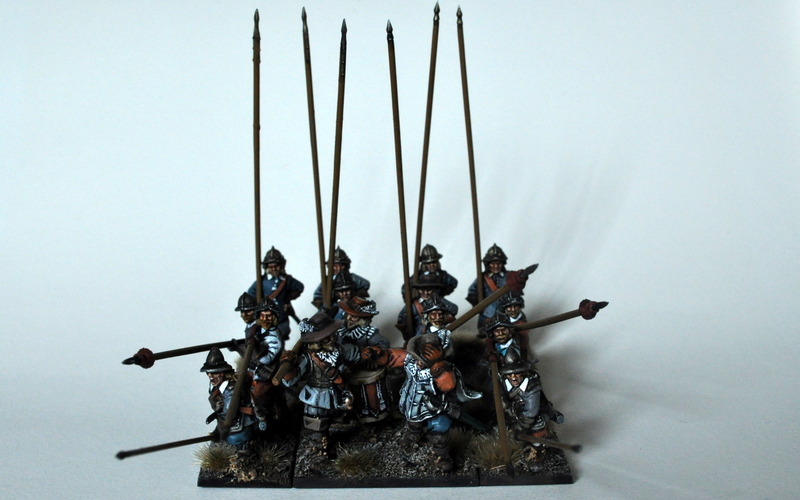 Apart from that: more ashigaru inbound, as well as some British Airborne. I’m especially proud of the latter. Check back soon! It’s been a quiet week again on the blog, mainly due to not having access to a camera. But fear not, multiple updates on my latest projects are inbound! 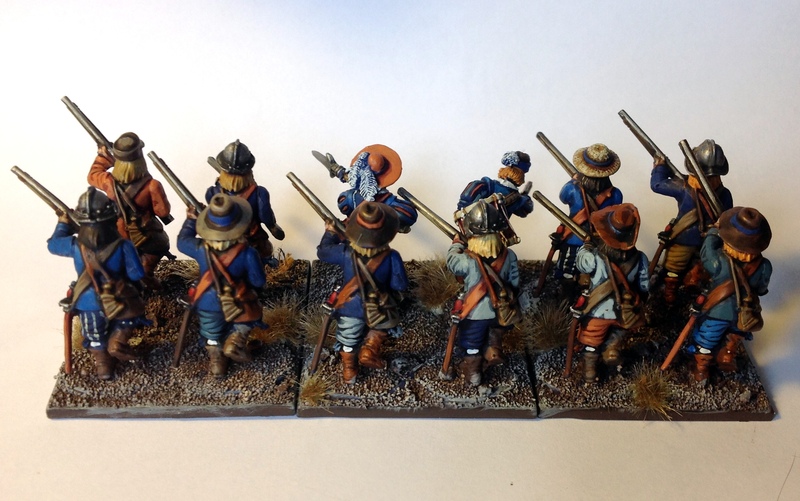 For now we’ll take a look at a batch of Dutch cavalry. Lovely plastic models from Warlord Games. 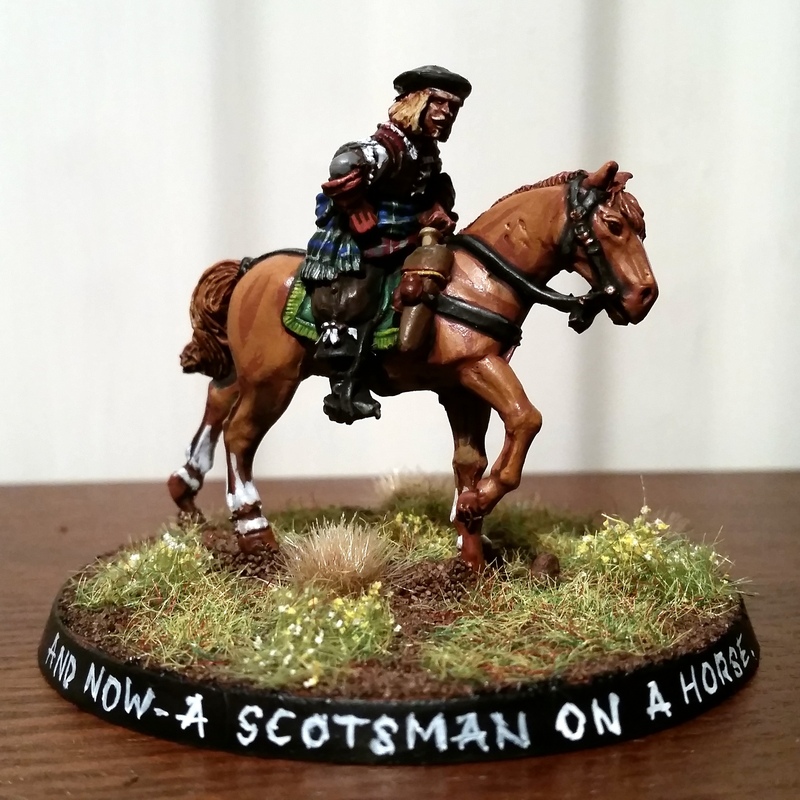 I got a box of these as payment for painting up the last two WSS generals in September, and of course I had to paint up a first batch of them quick sharp! 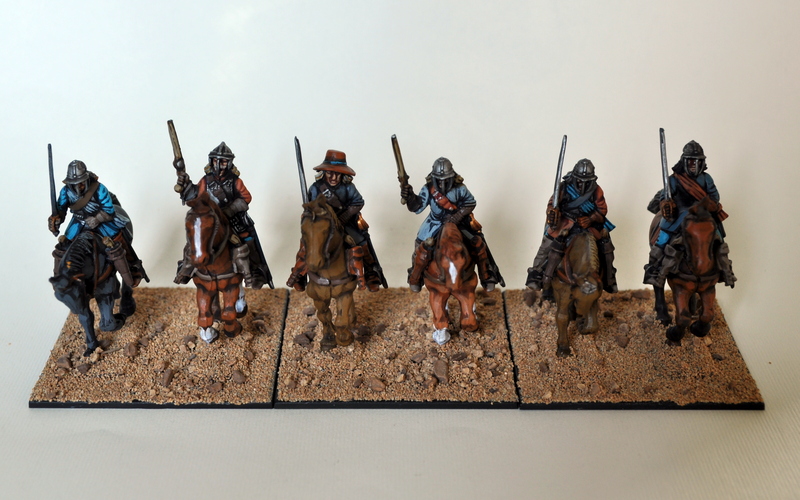 Although they’re marketed as Parliamentary cavalry they fit in well with Thirty Years War and late Eighty Years War models; I nevertheless carried out a minute conversion by giving the rightmost cavalryman a Swedish morion helm. I had a blast painting the flag finials and the little flag on the musician’s trumpet. 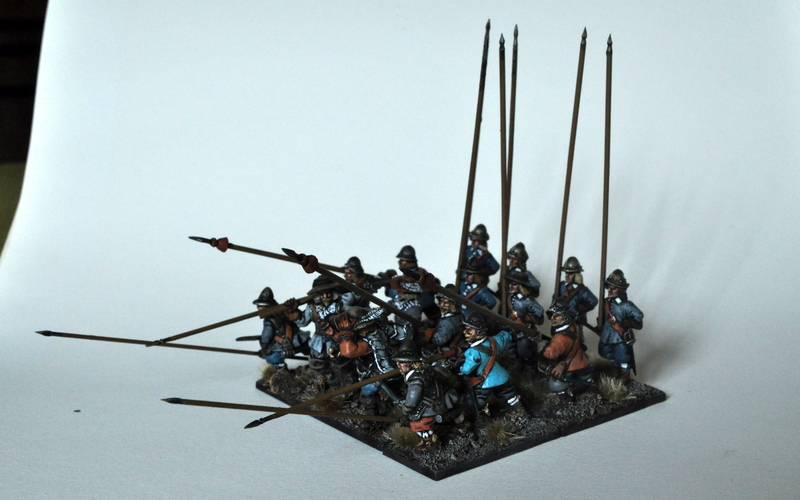 I decided upon a different spot colour from the cold blue-greys of my (first) infantry battalion, but wanted to keep to the blue spectrum. 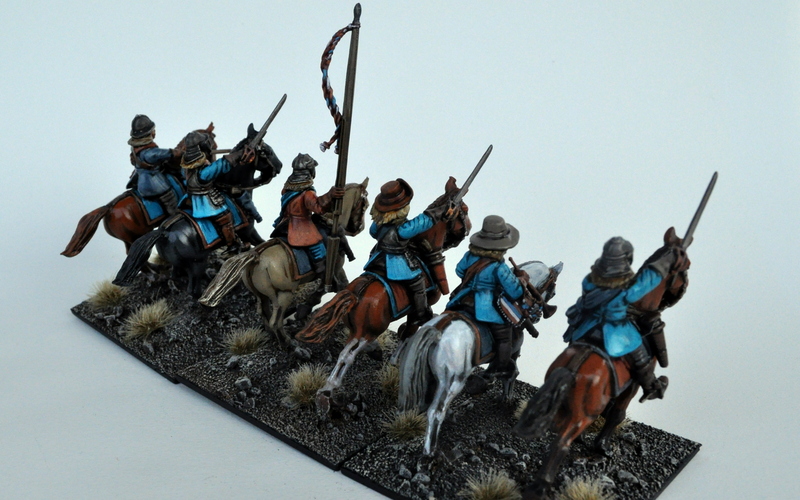 Hence this turquoise tone which I had already used extensively on my Arab warband. Apart from that there was a little bit of grey still used, and of course orange – they wouldn’t be Dutchmen otherwise! Best horses on the market? Possibly! 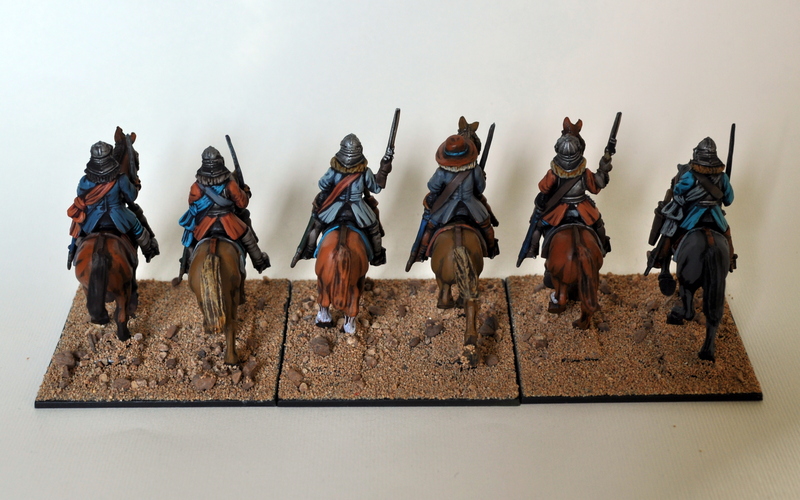 I had a great time painting these Warlord Games horses. They’ve got four different poses per sprue but you can vary these by mixing up the two halves of the bodies. Especially the pose of the horse in the foreground of this picture is magnificent, I think. 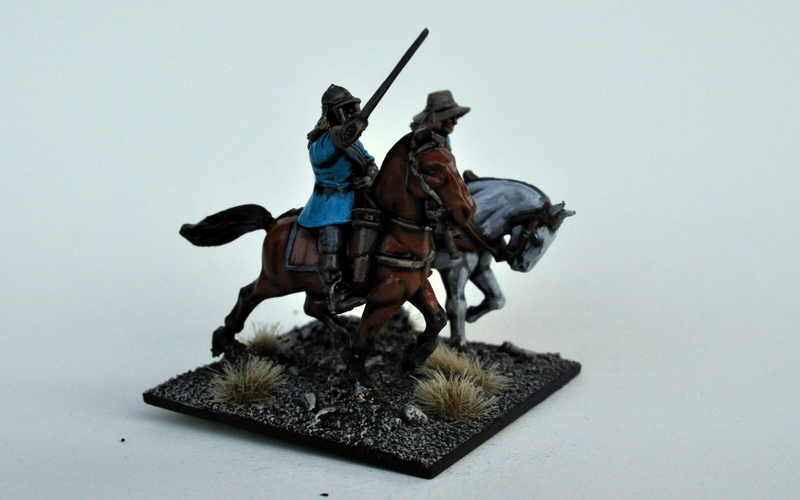 I’ve painted numerous horse models from many different manufacturers over the years, and these are probably the best you’ll find in 28mm. Warlord Games are currently holding a sale on individual sprues, so for 2£ per sprue you can’t go wrong with trying them out. That’s it for now! In the coming days you’ll be seeing Vikings; Rus Vikings, Jomsvikings and Viking casualty markers. Am I biased? No!